It’s end of semester for me which means lots of grading, tests to prepare, etc., but when I have a free hour or two, I grab it. 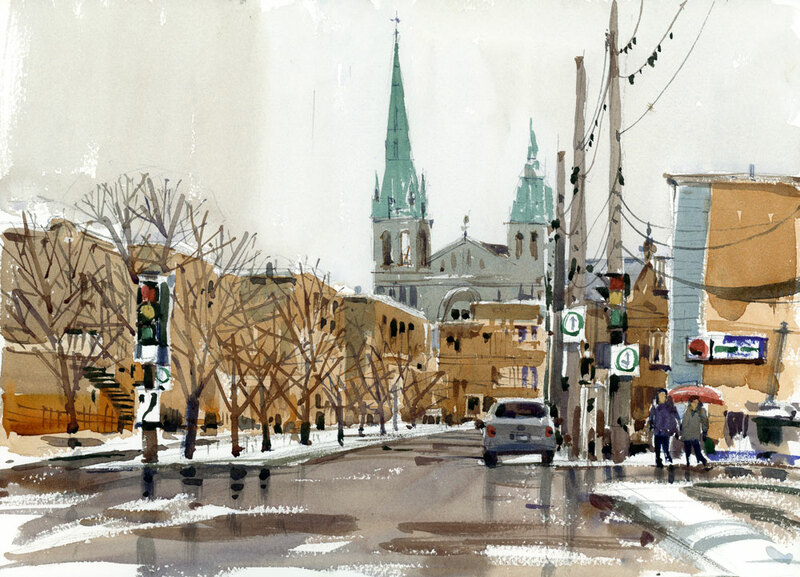 At lunchtime today, I drove to the Villeray neighbourhood, a favourite area of mine to sketch since the streets are full of life, there’s often parking, and I can find lots of great small buildings to sketch. Today’s struggle was with the rain. It wasn’t coming down hard enough to be a deterrent, but the light drizzle eventually blocked my view and every few minutes I had to turn the wipers on to clear up the car window. An annoyance, no doubt, but worth it because I was able to finish a sketch during my short break. Sketched on a block of Arches CP, 10″ x 14″. Superb sketch! You’ve captured the damp and the dreariness of this time of year, and the sparkle that can still sleep through. I find the teal steeple and the ochre (?) buildings very lively. Great motion in the figures. Love it! Thanks Alison. I was happy with the way the figures turned out. They actually seem to be part of the scene for once. Absolutely worth it. Let’s give a cheer for a good set of wipers. Indeed, hip hip hooray for wipers that don’t streak! Finally got the one on the driver’s side replaced. Now I don’t fear those rainy days! It’s like magic how the streets look so wet! 8X10 is a large sheet to have done that in a break. and I agree that you can feel the rain. Lovely painting. Gosh, this is absolutely beautiful! The rain soaked street, puddles of reflections, you captured so well. You’ve taken a ordinary, dreary day and turned it into a priceless treasure. Thank you for sharing. This one’s a gem! Love the teal color against the golds. You are so good at reflective surfaces. Also, snow, Also, trees. Also, flowers. You are a master! You are simply..the best! Love love your work! Susan, thanks for writing. Glad you like the work! Until I was 21, I lived on Villeray Street, in the 60´ and 70´. Please tell me which intersection you were at. Thank you for visiting my chilhood! The rendering you made is great!! Wow, that is amazing. I was facing east and very close to the corner of Lajeunesse. Glad I brought you back to your childhood! Love the composition, the rainy day feel and the almost but not quite complementary colours … and of course the traffic lights and power cables too! Thanks Tony. This was a fun one to do, despite the rain. This painting is awesome ! Hi…. This painting really caught my eye straight up. Like the colours …. if this is anything to judge by ….look fwd to getting your book in 2019. New to this blogging …just started up. These sort of paintings are inspiring. Thank You…. So nice of you to write. Good for you to start a blog! I wish you the best of luck and many followers. Fond memories again! I look at your sketches, Shari, and am in awe!! Then I try to figure out the steps you could have gone through from beginning to end. I’m still baffled!